The Plus Ultra pistol was produced in Spain during late 1920’s and early 1930’s. It was manufactured by the gun making company “Gabilondo Y Cia” – better known by its trade mark “Llama”. 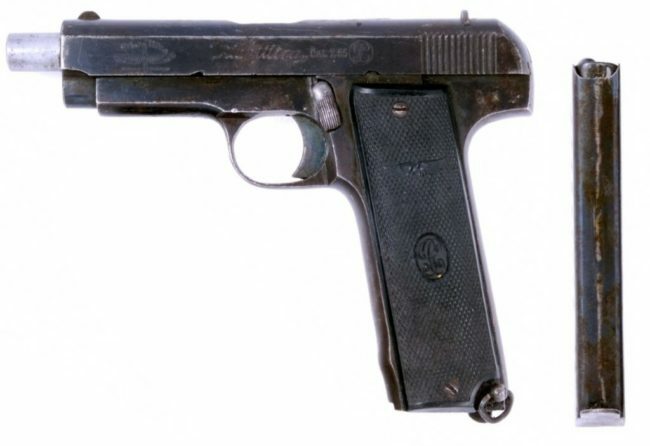 The Plus Ultra pistol was based on the WW1-era “Ruby” pocket pistol from the same manufacturer, only made much larger and with greatly increased magazine capacity. Gabilondo also produced a select-fire machine pistol called the “Non Plus Ultra”. These differed from the parent handgun design by the placement of the fire mode selector slider on the left side of the slide, above the grip. Many Gabilondo Plus Ultra pistols were exported to Southeast and Central Asia, most notably China and Japan. It is believed that Japanese officers made private purchases of these pistols, and so Plus Ultra pistols were quite popular among Japanese aircraft pilots from the Army and Navy during WW2. Plus Ultra pistols utilize simple blowback action. They sport a single action trigger with an internal hammer, and a manual safety is located on the left side of the frame, above the trigger guard. This pistol has an extended and widened grip that houses a double stack, double feed detachable box magazine. These can contain as much as 20 or even 22 rounds of 7.65mm Browning (.32ACP) ammunition. The magazine release is located at the heel of the grip. There were two slightly different versions of the gun, one with a standard barrel which has its muzzle almost flush with the slide, and another with an extended barrel, as shown above. All were equipped with simple, fixed iron sights.